Cycling in New York has increasingly become a part of any holiday. 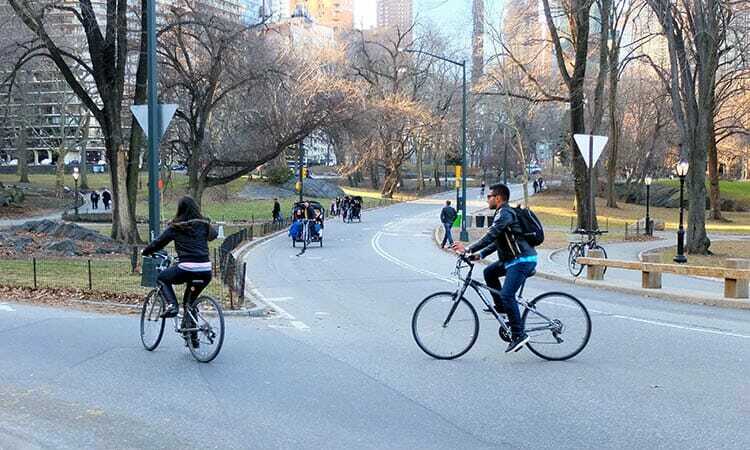 New York, and mainly Manhattan, offers lots of possibilities for cycling. Riding a bike along the two rivers or through Central Park is an excellent way of sightseeing and also a fun and relaxing activity. In the recent years the supply of bike rental companies has increased which has lead to a drop in the prices for renting a bike in New York. If you reserve your bike in advance, you’ll only pay a couple of dollars an hour. Popular routes cross the Brooklyn Bridge, Brooklyn Esplanade, go along the Hudson River, the east side of Manhattan or through Central Park. There are bicycle lanes all over New York. You’ll quickly recognise the green bicycle lanes on the avenues. The bike paths on the streets are marked with lines and signage (images of bikes). Although New York has more than 1,600 kilometres of bike lanes, biking through Manhattan can be challenging. New Yorkers tend to use the bicycle lanes to park their car and you’ll often have to navigate between yellow cabs and tailboards. Do you want to conquer this concrete jungle? Be careful and consider wearing a helmet.